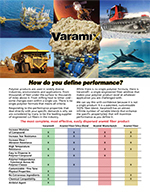 Varamix Aramid pulps target specific polymer properties that will define peak performance in your product. 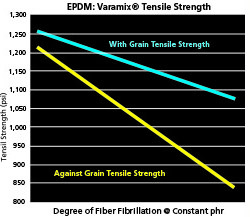 Standard market available aramid fibers and pulps include elastomer pre-blends of Kevlar®, Twaron® and Technora®; while Varamix® is a patented 100% fiber product which has a highly crystalline polymer chain. 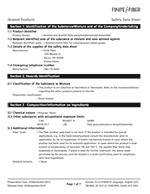 Polymer products today are used in widely diverse industries and applications. Uses range from aerospace to sub-surface drilling and exploration, from temperature extremes to abusively rough applicatons to life saving systems that must function in emegency situations. Consequently, the polymer compounds used are as diverse as the operations that they perform. 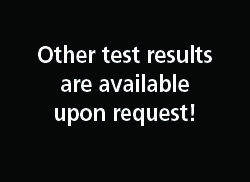 There is no single polymer formula that meets all criteria. 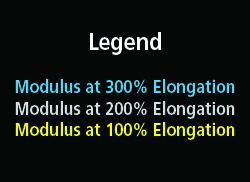 There is also no single definition for performance. Performance has to be determined by the properties that are most critical to your product functions. There is, however, a single solution - Varamix®. It is a single engineered fiber reinforcement additive that makes your polymer products excel in whatever environment and operation it is applied. We confidently state this because it is not a single product. 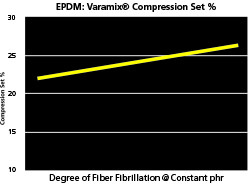 Varamix® is a patented, customizable 100% fiber blend with an almost infinite number of variable combinations. 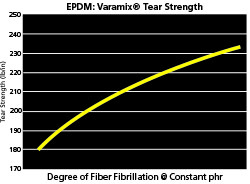 Varying the degree of fiber fibrilations enables Varamix® products to enhance specific targeted compound characteristics with predictability and consistency. You define what performance means and our team of fiber experts will perform anything from a tweak to an overhaul that positively impacts your finished compound. 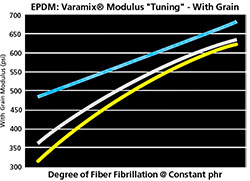 This study demonstrates how Finite Fiber’s Varamix® aramid fiber blends can be customized to meet your specific polymer compound property requirements. 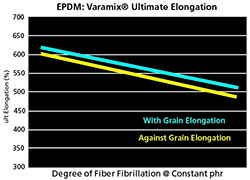 Our ability to introduce different degrees of fiber fibrillation during the proprietary blending process, enables our technical team to work with the compounder to develop a unique balance of cured compound performance properties. Previously polymer compounders were limited to only altering the concentration of single fiber structure. 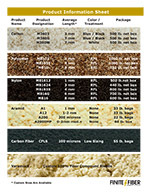 With a customized Varamix® product properties can be optimized to a much greater degree. 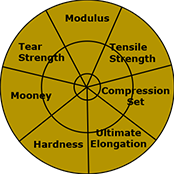 Depending on what properties are most important, we have a balanced reinforcement solution for you. 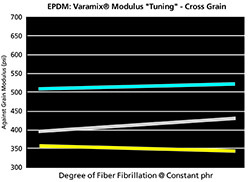 The following graphs are for an EPDM compound with a constant 12 phr loading of Varamix®. 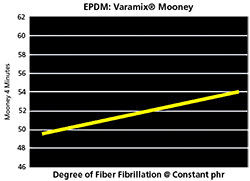 The x-axis represents the various fiber blends or the degree of fiber fibrillation. The “with grain” orientation was set on a mill at a 2 minute run time to simulate fiber orientation in the various polymer processing technologies.